Visit our new "2012 Part 4: Inspiring 2012 Resources, Confirmations and Quotes"
Welcome to the Miracles and Inspiration call for February 17, 2009. I am one of your co-hosts tonight and my name is Scott Mowry and our other co-host who is with us tonight is Dan Rezac. Dan, how are you tonight? On tonight's call we are going to be covering a wide range of topics and some exciting new additions to our web site. We are also going to be covering another new part of our web site which is a special page in our 2012 section. This page is entitled "2012 Inspiring 2012 Resources, Confirmations and Quotes." And finally, tonight we will also be beginning a series of "Wealth and Prosperity Classes" to put a better understanding of this economic crisis we are going through at this time. We want to remind you that if you wish to be on our mailing list, you can do so for free by sending an email to us to the following email address: info@miraclesandinspiration.com. If you think you are on our mailing list but not receiving our email updates, then you may contact us and let us know and we will try to rectify that issue for you. We also want to remind everyone, we do not do our call every week, but rather we are trying to do a call as often as we can, as our schedules permit. Unfortunately, this sometimes means we are only able to do a call once a month during some months, or sometimes two per month. So we recommend that you check our conference call section by going to miraclesaandinspiration.com/calls.html to look for our latest announcement for the next call. I also want to send our a special hello and thank you to all of those who attended my most recent seminar, "Transformations into New Paradigms II" in Seattle, WA over the weekend. It was an honor and a privilege to have you in attendance and I am most grateful to have been allowed to speak before you. So thank you again for coming. Dan, what do you have for us tonight to open up the proceedings tonight? See your hand. See how it stretches out to another in greeting and friendship, a symbol of openness, integrity and welcome. See how it seals a pledge, a promise of truth and loyalty. See how it soothes in comfort, compassion and love. See how it excites passion. See how it heals with its touch. See hands of different colors, different sizes, different ages. See them all reaching across and clasping each other in peace and love. See them dance and speak. See hands held between lovers as they walk or stretched across the table in deep conversation. See hands drawing beauty, painting colors. See hands forming the clay and freeing the statue within the marble. See hands writing words of deep wisdom, joy and peace. See the hand that writes a love letter and wipes away a tear. See the aging hand writing a will. See the hand of power signing an alliance. See the hand as it presents a rose to another. See the hands that hold the newborn infant, its own hands like little flowers of promise. See calloused hands with nail and hammer, building a home. Today, celebrate your hands. Feel the energy of your body moving into your hands. Feel how your heart, with all of its love, can flow into your hands. Feel how your true integrity flows there easily. Today, see your own hands for the wonders that they are, whether they are young and fresh as springtime or covered with the marks of wisdom and experience. See them for the wonders that they are and take this pledge: that your hands shall be filled with love and healing, truth and loyalty, and that you shall use them to build a world of peace and beauty. Let your deep truth resonate within you, shining out more brightly than any other light, and then let this light fill your hands, so that the actions you perform, the pledges you make, the love you express, the art you create, shall all flow directly from your heart and soul, into your hands and out into the world. We want to remind everyone that the most recent current events, news updates and additions to our web site can be found in our News section on the left hand panel of the main page. Just go to www.miraclesandinspiration.com/news.html to find this page. David Wilcock was back yet again, on Coast to Coast AM, a week ago Friday, February 6, 2009. He was on for nearly two hours and during this show it was quite interesting because he debuted a selection of song from his forthcoming musical album, "Wanderer Awakening" which will be released on April 15th. You can listen to this entire interview by going to our David Wilcock radio interview section and clicking on the links: Parts 1-7. David Wilcock musical selection from Coast to Coast AM, February 6, 2009 audio clip. I wanted to talk more about the new 2012 page that we recently added to our 2012 section, that we have entitled, "Inspiring 2012 Resources, Confirmations and Quotes." The year 2012 is fast approaching. As we enter the year 2011, time is expected to accelerate as much as 20 times faster than it was in the year 1999, when we entered a time acceleration period on January 4th. According to Maya and 2012 researchers, Barbara Hand Clow and Carl Johan Calleman, in their book "The Mayan Code: Time Acceleration and Awakening the World Mind," the Mayan calendar predicted this economic crash that we find ourselves in today. Eventually, it is prophesied that it will bankrupt the war machines and create the opportunity for real and lasting peace on Earth. In keeping with these dramatic developments, we have just added a very special page to our 2012 section entitled: "Inspiring 2012 Resources, Confirmations and Quotes" which will help to better inform you of the 2012 event. But more importantly, it was designed to inspire and excite you about this incredible transformation of the Earth and its people that is about to unfold. Here you will find messages from great 2012 experts such as David Wilcock, Sri Bhagavan, Drunvalo Melchizedek, Dannion Brinkley, José Argüelles, and the aforementioned, Barbara Hand Clow, with many more to be added in the future.. In addition, our 2012 section has numerous other resources and 2012 researchers such as William Henry, Jay Weidner, Daniel Pinchbeck and Michael Tsarion, among others. 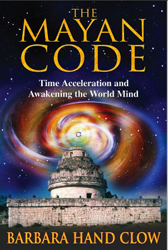 So I want to go over this book "The Mayan Code" in a bit more detail tonight and talk about the concept of "time acceleration." Does everyone remember what the big event was during 1999? Remember, back then about Y2K and that supposedly what was going to happen was that all of our computers would stop working because we were about to change centuries from the 1900's to the 2000's? Well, here is what really was going on back then. On approximately January 4 or 5th, 1999 we entered a new time acceleration phase that began to speed up time dramatically. So dramatically, in fact, that by the time we enter the year 2011, we will be living in a reality of time that will be 20 times faster than it was in the year 1999. "What's going to be going on in 2012? Astrology definitely shows an incredibly enlightened development of consciousness during 2012. ...we are going to complete the time acceleration of our evolution and make that next critical leap, which means going beyond war and beginning to enter the (galactic) universe. A then in 2012, it looks like it's a year of really amazing experiences with that reality. It's a year of integration, as far as I can see. (The book) "The Mayan Code" predicted the economic collapse would be occurring during the end of 2008. And then what the book says is, once the economic collapse occurs, then it will be possible to end war... from an evolutionary point of view, this is the final exhaustion, because the planet can't take it anymore. And then, according to exopolitics, once we end our violence and go to another level in the way we treat each other, our quarantine is going to lift, which I fully expect will be occurring during 2011." 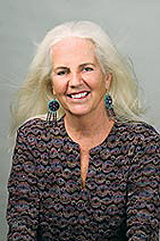 Listen to Barbara Hand Clow in her own words from the entire interview with Exopolitics Radio, Part 2 – January 17, 2009.